If change is the only constant in life, then Danny Murphy exemplifies this adage as he has successfully and consistently evolved. 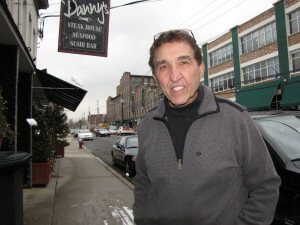 In 1949 Danny’s family moved to Red Bank from Hempstead, Long Island, NY. He was in the third grade at the Oakland Street School. And here is where his entrepreneurial roots began. To support the family, his mother opened the Friendly Luncheonette on West Front Street serving breakfast, lunch and dinner for the next eight years. Danny recalls the famous “blue plate specials” and yes, there was a blue plate. The next family venture was in 1957, a partnership with the Brother’s Restaurant where Danny officially began his culinary career cooking pizzas, which he actively continued through high school and college. After graduating Interboro Institute, Manhattan, NY in 1965 he became a Court Reporter in Freehold, NJ. But there was something significant missing in Danny’s life – his passion for food and the sense of community he felt when people gathered and shared a meal. In 1969, Danny opened what began the legacy, Danny’s Pizza Hut on Bridge Avenue in Red Bank. In 1970 the name was changed to Danny’s Italian Restaurant which remained for the next twenty five years. During this time, he sharpened his skills and talents opening several restaurants including the Church on Main Street, Matawan, NJ in 1980, the Charlie Horse Café, Middletown, NJ in 1984, Candy Dancers, Santa Cruz, CA, in 1987 and Nibbles, Ocean, NJ in 1989. During the years, Danny garnered a loyal following but continued to create innovative concepts. With the resurgence of his neighborhood as a dining destination, his keen observation and marketing savvy guided him to expand his repertoire. In 1995, after extensive research, fine-quality, dry-aged steaks were added to his menu soon followed by fresh seafood and sushi. For close to four decades Danny’s has thrived on change and with every change the restaurant prospered. Danny has created not just a restaurant but an institution. It is itself, its own entity. As a pillar in the community, Danny was one of the original founders of the Red Bank River Fest in 1980, a charter member of the Red Bank Special Improvement District (SID) started in 1990, board member of the Monmouth County Food Bank and the Red Bank River Center, and President of the Red Bank Art and Antique Center. When not rolling up his sleeves in the restaurant or catering an off-premise event, or volunteering for the countless organizations he supports, Danny can be found enjoying his boat and cruising the local waters. He also sails, iceboats and is an avid racquetball player. When his schedule permits, he loves traveling to places where there is water and of course, great food. Danny resides in Red Bank, NJ. He has two children and three grand children.